We have reduced our Hikari even further! 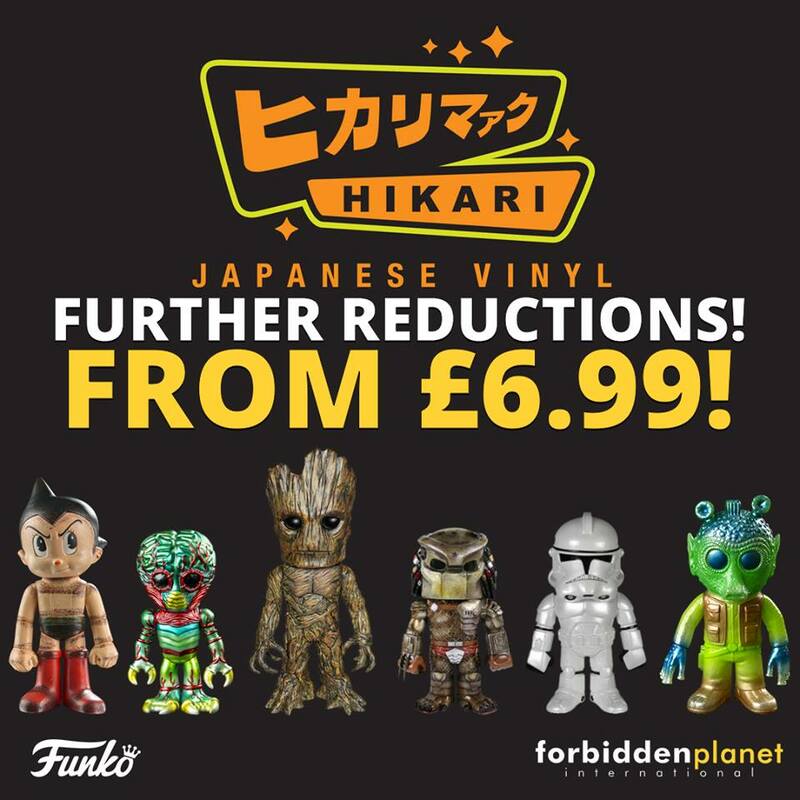 Get some awesome Hikari from just £6.99!! 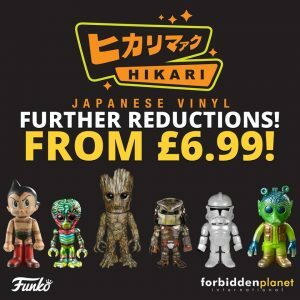 HUGE FUNKO HIKARI SALE! ? We have a huge selection of Funko Hikari products in stock at various Forbidden Planets stores! And they are all on sale from an amazing £6.99!! These Premium Japanese Vinyl are a must have for any collector. These products usually retail up to a whopping £69.99. Don’t miss out on this incredible sale, and most importantly, these amazing collectibles! Thanks for your comments. This post will be updated shortly as there are many more than just the Hanley (Stoke-On-Trent) store that are partaking in the sale. As for stocking sale items across all of our stores, it is ultimately down to the store itself to place orders from the warehouse and sometimes they simply don’t have the space to take the stock. If you have any outstanding orders from the old retail site you can get the details using the “What about my orders?” page and then contact sales@forbiddenplanet.co.uk with your order number/s and we will endeavor to get you sorted out as quickly as possible. You can not buy anything from this web site anymore. Therefore this site now focuses on our physical stores for the foreseeable future. We are sorry for any inconvenience. Are the offers you show on this website only available in your shops? Tried your “Contact Us” email address and it does not work. Hi Josh, yes this site is now purely for information that pertains to our actual stores, there is no online store anymore but the sister comics site has not changed and is still available here. The email address sales@forbiddenplanet.co.uk should be working fine. First off let us just say that it was for customers like yourself that we kept the home shopping division going for many years. It is indeed a massive shame we had to close our home shopping division. We are currently focusing on our physical stores until further notice. Unfortunately none of our stores has the ability to ship mail order items at this time. We thank you for your custom and hope you can get to pop in now and then considering your distance. I’m over 70 miles from the nearest store. I spend hundreds each month on forbidden planet online. I’m super disappointed in the online side closing. It doesn’t help that the “local” shop manager runs his FP shop like a dictatorship & makes you feel unwelcome when buying lots of stuff. I make a point of not going to the shop because of him & buy online. Just to add, I’ve never seen a chase funko in my store & when i asked about them they kinda laughed at me. (I’ve found chases in all my other local toy stores) At least there was a chance of getting a chase if you’re purchasing online. we appreciate all of our customers whether you spend £5 or £500 and you should not ever feel like you’re causing a nuisance and the like. Shop Staff are there to help you the customer, that’s their job, especially the Manager! When it comes to Funko Pop!s it always gets messy especially when there are Chase figures involved. We advise all of our stores to put out everything regardless of what it is. Very often they are 1 in 6 and get snaffled up pretty quickly. If you would like to get in touch with me just email sales@forbiddenplanet.o.uk and put Att of: Lee, and I will try and sort out/resolve any issues you may have. Hi, when does this sale end? What a joke, A company falls on hard times and restructures its business to stay trading and they get nothing but bad attitudes as a result! Personally I’d rather have the stores still open than order online, i much prefer mooching round a shop than sat looking through web pages, always end up leaving with something I’d never thought about getting before i went in. Since you closed your online store do you have plans to open anymore stores. Like in Hull. Leeds and Sheffield are a bit far to go just to browse. Can the other store like in Newcastle forbidden planet get some new pops and exclusives that international get in store and why are the chases like £23 and in your leeds shop there are only £14.99…. Also would be good for myself and others to get some hot topic exclusives with stickers in store…. The Newcastle Forbidden Planet is nothing to do with us. While we share a similar name we are two different companies! As for Hot Topic stickers on Funko Pops, we do get some on occasion but it is completely random what we are sent from Funko themselves. Hope this helps! Only outstanding orders will be emailed to you. We are honouring all orders placed up until Sep 8th 2018. Very shortly all customers with outstanding orders will be contacted via email with instructions of what to do next. Hope this helps.